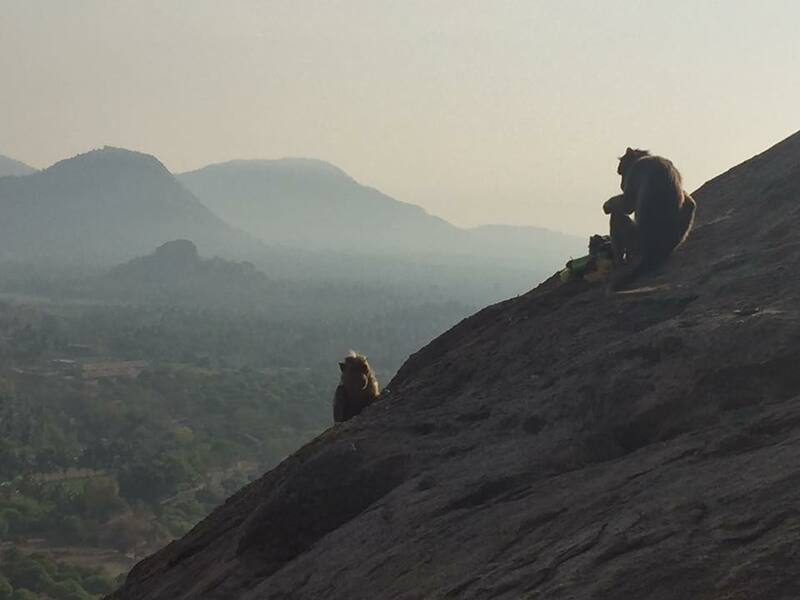 Bangalore is truly trekkers paradise, many trekking spots, hills within 100 km of range. 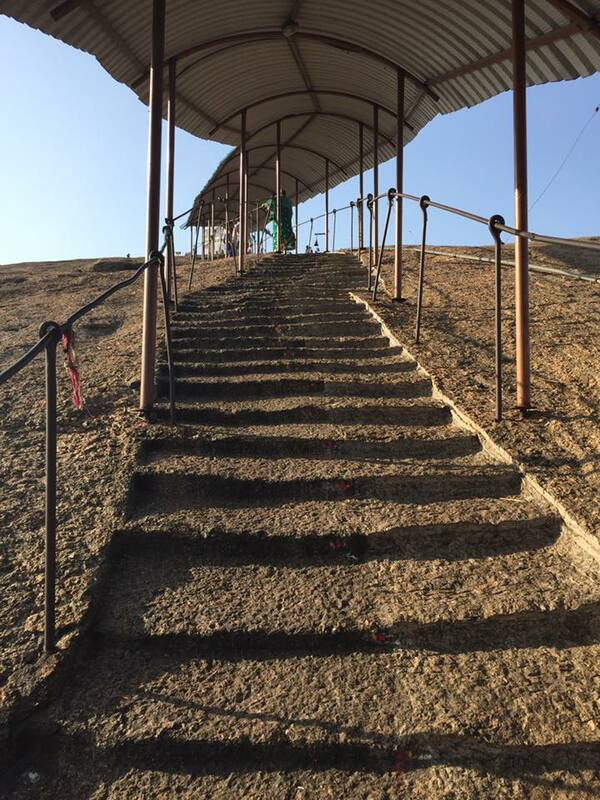 Sri Revana Siddeshwara Betta or in short SRS hill is one of it, located in small village, 60 km from Bangalore. My plan was to reach there early morning to see the sunrise, but I was late as usual and reached there 7:30 am. 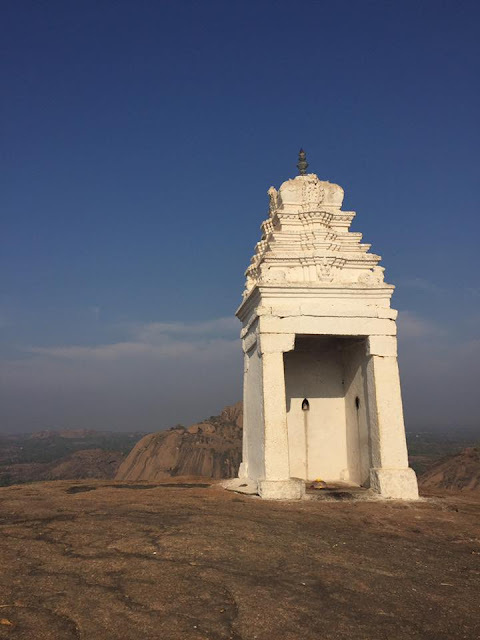 Drive from Bangalore was pretty good, NICE road (23 km), Mysore Highway, reach Ramanagara (33 km) then take right turn, another 13 KM and you will reach at the base of huge monolithic stone. After visiting second temple, we started our trek. Just follow the slabs of stone that have been laid out for visitors. Steps have been carved in the rock surface and good things is there are iron rod supports and shelter upon your head to protect from sun & rain. Though the shelter takes away the beauty of hills and trekking experience but its good during summer and rain. Trek was pretty easy and hardly took 20-25 mins for us. The more you trek up the more beauty of nature gets revealed. Not crowed, but monkeys everywhere. As long as they are in their own zone and ignores you while they eat something or playing , you will be ok. But if you try to attract them or offer some food then you will be in trouble. Once you reach at the top, you will see two small temple like structure and bell at the center. The view from here is breathtaking, complete 360 view without any obstacle. You can see the beautiful lake, other hill range and the small towns. Sri Jagadguru Revana Siddeshwara traveled across the country and left many miracles in helping distressed, poor, and backward people and established socialism and secularism long ago. Overall it is good weekend gateway from Bangalore. Mix of religious and trekking adventures. I would suggest to visit this place early morning and reach at the top. I am sure you all will be greeted by breathtaking beauty of nature and sunrise. While returning we stopped at Kamat Lokaruchi. Delicious and yummy breakfast added spices to yet another weekend adventure.